Sabudhana or Sago kheer is the traditional and most common Indian sweet prepared during fasting days. It can easily prepared in less than 20 minutes. Sabudhana is best at its own taste but the it further be innovated by combining with bottlegourd or mango. The fusion not only enhances the flavors of kheer but makes it different from regular sabudhana kheer or sweet. 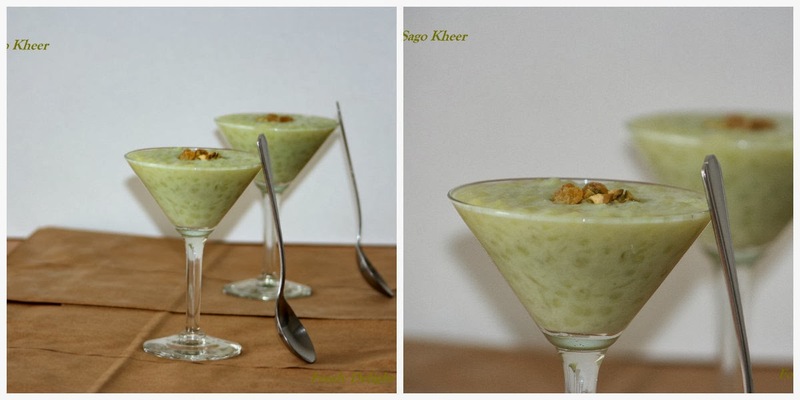 Do try this recipe and relish different version of sabudhana kheer. Lets look in the recipe. Peel and grate dudhi/ bottlegourd into cold water to avoid discoloration of shredded dudhi. Heat ghee in a pan and add dryfruits and shredded dudhi into it. Stir it till the grated dudhi becomes tender and soft. In another pot take 1 cup of water and add sabudana into it. Boil it till sabudana becomes soft not mushy. Then add cooked sabudana into the cooked dudhi. Mix well. Add coconut milk and sugar . Mix well and bring the mixture to boil. Cook for another 5 minutes and switch off the gas. Then add cardamom powder and mix well.